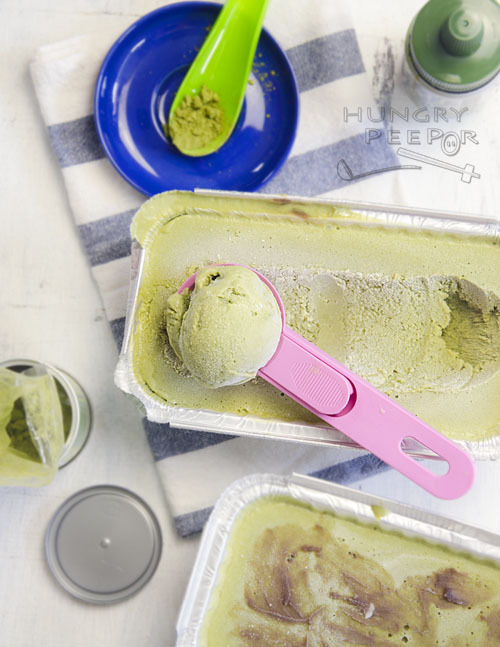 My dear husband – he’s been experimenting with ice-cream half his life… okay maybe not, but ever since he watched Jimmy’s Food Factory, he’s been trying to better his recipe and skills at making ice-cream that’s fluffier and softer. I kept telling him it’s time to buy an ice-cream maker – a good one mind you, not those cheap online machines that can’t do much with their small spinning motors. We are still procrastinating and using the small machine that we bought off Taobao. It is not altogether that bad, but if we need to make better ice-cream, and more of it, we will definitely need something better. 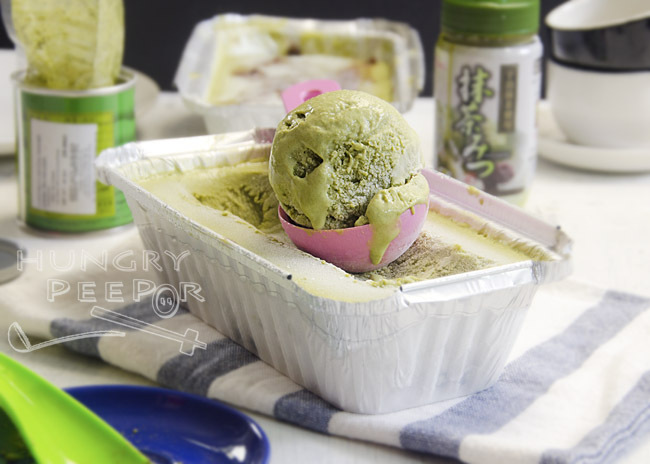 Anyway, this time round, he decided to make a batch of matcha ice-cream for me. Can’t recall exactly why this flavour, but most likely because of the trip to Japan and the lingering thoughts of this paradise. And maybe because I love matcha too. If you love ice-cream that is thick and creamy, this recipe is definitely made for you. 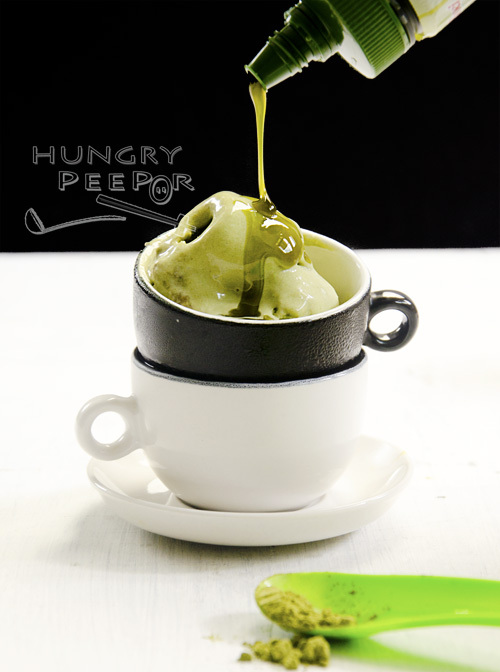 It has a nice lovely creamy texture to it which does not compromise the matcha flavour, making it really addictive and dangerous. Whisk 1 cup of cream with matcha powder till smooth. In a separate bowl, whisk egg yolks till smooth. Heat remaining 1 cup cream, milk, sugar and salt in a saucepan on medium heat for 3min till edges start to bubble. Stop before it boils. Turn heat to low. Scoop out 1 cup of mixture and gradually whisk this into the egg yolks. Pour this mixture back into saucepan. Cook for another 4-5min till thickened. Pour egg mixture into matcha mixture. Place this mixture on top of another bowl filled with ice cubes and leave for 15min till it’s reduced to room temperature. Cover and chill in fridge for 4hrs. Place a loaf pan in the freezer to chill for 1hr. Remove mixture from fridge and leave to set in ice-cream maker (for as long as is required depending on instructions for your ice-cream maker). After churning, scoop 1/3 of ice-cream mixture into loaf pan. Drizzle azuki red bean paste on top, swirling with a spoon. Repeat with the rest of the ice-cream mixture until all of them are used up. Freeze for 4hrs till set. Remove from freezer 10min before serving. The guy bought a matcha green tea syrup to go along with the matcha ice-cream as a topping. It’s quite nice – not too sweet and overwhelming. This syrup is available at most of the Cold Storage outlets in Singapore. 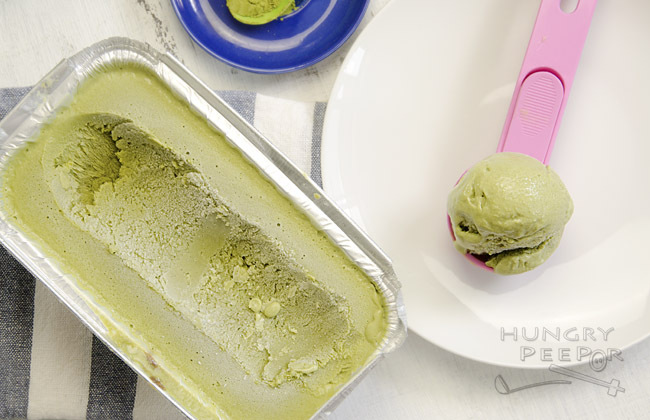 This recipe was kindly adapted from Meg Is Well’s Matcha Green Tea Ice-Cream With Sweet Red Bean”. Note that because the Azuki beans are very sweet, you can decide if you’d like to add more of this and reduce the sugar level. This entry was posted in Dessert, Japanese and tagged Azuki, Frozen, Green Tea, Ice-Cream, Matcha, Red Bean Paste. Bookmark the permalink.